Before you call us crazy, we know it’s a little outside the box. There’s unequivocal value in race kit. It’s heavily photographed and sponsors pay good money to be represented there, and for good reason! Race kit is designed to photograph really well in races. The thing is, we also spend a lot of time riding outside of races and want to look just as fabulous then, too, but sometimes more discreet too. Our team is fortunate to work with Castelli, who is a leader in the custom apparel space and full of adventurous spirit. When we approached them about the race kit/team kit idea, they were eager to see what we’d come up with. Our team is made up of coffee lovers. Our weekend hosts are frequently surprised when each of us starts pulling hand grinders, bean varieties, and different brewing methods out of our travel bags. But, hey — every semblance of home while on the road is important. Plus, as a team of women with professional day jobs and professional race schedules, let’s just be honest about the need for a little caffeine boost now and then. We wanted a pattern that would look great up close, but that also looked visually appealing to a person standing too far away to know what the icons were. Additionally, we wanted a design that would look great in full custom, but would also pair really well as a jersey with plain black bibs. I’m biased, but I think we nailed it. Beyond showing off the power of Castelli Custom (did I mention yet that they lined the print up perfectly across the zipper?! ), we’re opening these kits up for sale. Any proceeds will help fund our team’s season. 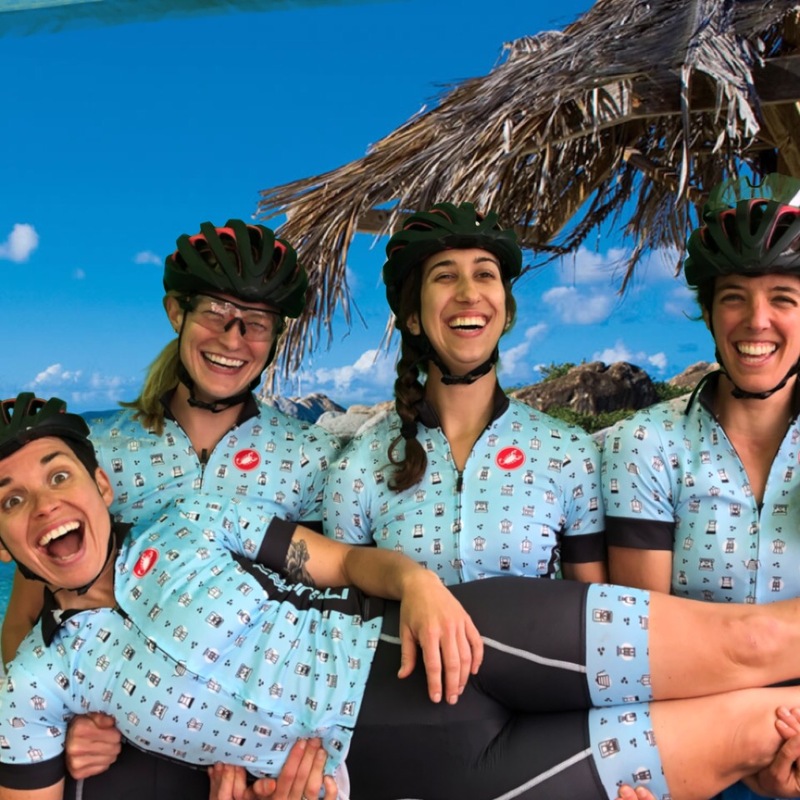 If you’re into cool kits and supporting women’s racing teams – this is a great chance to get something cool and help us do something cool too! Running an elite level racing team is expensive. All four of us are making the trip to Reno, NV for Nationals. Again, biased, but this is a cool chance to look fresh and support the team. The inside of the collar says “Coffee powered”, and in a tribute to our PhD scientist member we added the caffeine molecule to the back pocket. The kit will be pre-order only. For real. We’re doing a one-time order and then it’s gone. We’ve got a web store open on the Castelli site here, and will leave orders open for roughly 10 days. This should let us get the kits turned around before the holidays, you know, just in case you’d like to get one of these as a gift for the coffee drinking cyclist in your life (hint, hint). If you’re in New England, we can hand deliver at a race. If you’re not in New England, we’re working on some cool goodies to include in shipped packaging. If you really want the kit and don’t want to have to press extra buttons, we’ll even let you Paypal/Venmo/Square one of us and we’ll take care of the admin stuff. That’s now much we care. Just placed an order from cold Canada, where CX season is synonymous with frostbite. Eh, who am I kidding, it looks just as bad for your race tomorrow. Good luck with the race!